Items are submitted to us by free2collectors from around the UK. Once these items are checked by our moderator they are added to the Available Items or Wanted Items lists. At this stage other free2collectors can express an interest in the item. The item owner and the interested free2collector then arrange collection between themselves. We have collected 60 of this coin design from a local post office, one per person is available free to collect. 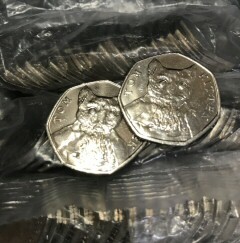 The coins are located in Somerset and are available to collect from a public house. If you are interested please email freecoin@free2collect.co.uk for more details. Free 2 Collect ran from 2006 to 2011 as a way to pass unwanted items on to other people, reusing a product for it's original intended purpose instead of it ending up in landfil or partially recycled into another product at a cost to the environment. The website itself was recycled in 2011, but we are now considering returning this website to its original use. There are still a number of links from press and council websites in respect of the original concept of re-homing unwanted items based on "One Man's Junk Is Another Man's Treasure".